Unlike conventional methane detection methods, which must be in direct contact with the gas in order to detect it, LMm enables remote detection of gas leaks. With a range of 30 metres in standard mode, or 100 metres with a reflector, LMm enables operators to detect methane gas from a safe distance. As the laser beam can penetrate some transparent surfaces, such as glass, LMm also detects methane through a window allowing closed premises and confined spaces to be checked faster and more safely. LMm is ATEX approved for use in explosive environments, including remote-monitoring applications such as closed or confined spaces, above-ground riser pipes, and pressure-regulating stations. 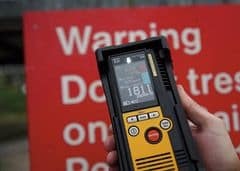 The typical response time of LMm is just 0.1 seconds, making it ideal for quickly scanning an area for a suspected leak and further minimising the time that operators are exposed to a potentially hazardous environment. LMm uses infrared laser absorption spectroscopy which measures the specific wavelength of infrared light that is absorbed by methane gas. This provides superior accuracy and specificity for operators by making LMm immune to other gases and eliminating the risk of false alerts. LMm performs a shelf check and an internal calibration at start up. This requires no training and ensures readings are always accurate and reliable. As LMm doesn’t need regular recalibration, it doesn’t require the routine 6-monthly maintenance that other detectors need. LMm is a compact and lightweight unit, which enhances operator comfort and ease of use. All measurements are displayed in both numerical and graphical formats to simplify operation. LMm is widely used in gas distribution companies by teams responding to reports of leaks, as it enables them to respond rapidly and stay safe. About Crowcon Crowcon Detection Instruments specialises in developing, manufacturing and marketing innovative, reliable and cost-effective flammable and toxic gas detection equipment. The company was formed in 1970 and has constantly led the field with products designed for safety and environmental monitoring. Based in Abingdon, Oxfordshire in the UK and with branch offices in Holland, the USA, Singapore, India, the Middle East and China, Crowcon's products are sold throughout the world, serving oil, gas and petrochemical companies, public utilities, clean water and sewage treatment companies, fire brigades, construction companies and other organisations where accidental leakage of gas or vapour can become a toxic or explosive danger. Visit the Crowcon website at www.crowcon.com.